Carte de visite (CDV) photo measuring 2.5 x 4 inches. Torn portions of three revenue stamps (2 cents each, blue, George Washington) on the back. Photographer is L. Meyer of Milwaukee, Wisconsin. There was no six-cent tax on photos, so I assume these fragments of three stamps were intended to equal one stamp (though I think the government frowns on such manipulation). If it was a two-cent tax, then the photographer charged up to 25 cents for this photo. The photo is undated, but the presence of a revenue stamp narrows the date range to 1864-1866. The photo is unidentified, but it comes from an album from which I have previously posted other pictures. I recently read an excellent book (Confederates in the Attic, by Tony Horwitz) that dealt with the American Civil War. Among other things, it talked about the changes that the United States has experienced in the last 150 years, from shifts in social mores to advances in medicine. 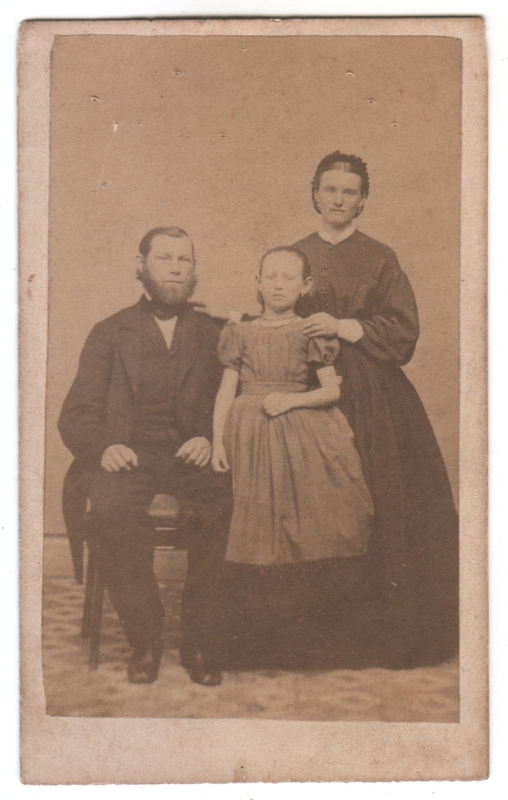 While this family would not have experienced battle firsthand in Milwaukee, they nevertheless lived through a time of calamitous upheaval, and as I look at them calmly posing for this portrait, I can’t help but think that there is something deceptive about it. But then, it’s entirely possible that people 150 years from now will look at photos of us today and say, from their perspective, “What times they lived through! How did they cope?”, and I am reminded that on some level all photography is deceptive in that way. I really like this photo on many levels–first the mother and daughter and wearing very classic 1860’s dress, and the mother’s ribbonwork hairnet band is lovely. The daughter dress, although exremely typical for the time, actually lokos very modern tome. Even though they look “calm”, both parents have expressions that show they are deeply aware of what the country is experiencing. I’m glad you like the photo! I had the same thought about the girl’s dress, that it looks oddly modern, so I’m glad you confirmed that. I guess part of the point I was clumsily trying to make was that it might be a mistake to assume we know what’s going on in people’s minds based on some sweeping historical perspective, that life can have a banal normality even when larger events are happening in the world, but at the same time people might try to affect such calm as a way of coping. I like this one. I’m from Northern Virginia, so the early history of our country was so ingrained into me. I think I do see concern in the parent’s eyes, though I do totally agree with you, Matt. Photography doesn’t always tell the story the way it is. A terrific post, Matt! Thank you, Katie! That book I mentioned was written by a guy who got sucked into an obsession with the Civil War as a result of living in Virginia. I guess in some ways, vintage photography is just an aspect of history, where there are observable facts, and yet so much is open to interpretation.